This was the first time I am trying this fruit. Yes, I am out of my comfort zone and have been trying different fruits and veggies that I’d not tried before. 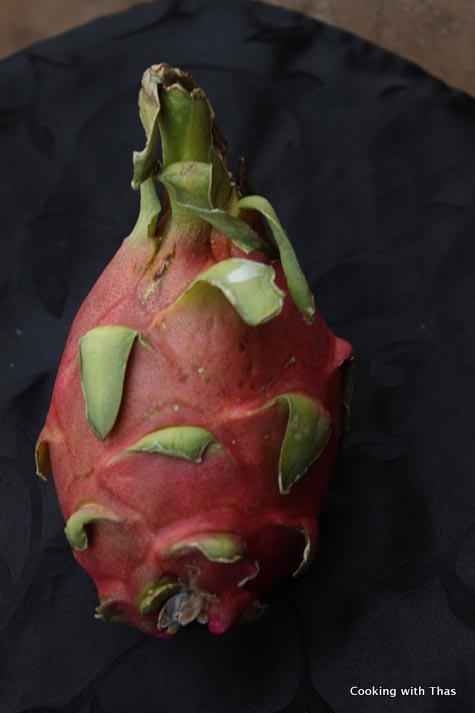 This fruit is always seen at Asian superstore, still it took me so long to grab one of them and have a taste. Some of the North American stores also has this at their fruit isle, I actually got this from Walmart. It’s a pretty looking fruit, I love the pinkish red color on the outside. I was curious enough to cut it, see the inside and to taste it. 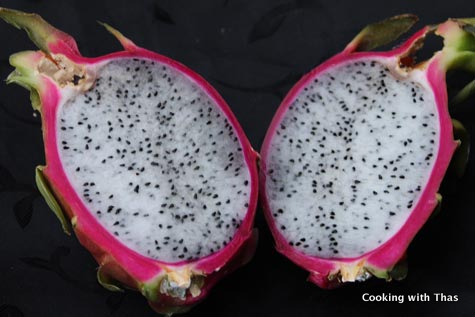 The inside view is quite different from the outside, it is black and white, white flesh with black seeds. The seeds actually looks like sesame seeds. Since the outer skin is tough, I wanted to save it and serve the cut fruit on it. Very gently, I ran a sharp knife along the sides of the fruit and took the inner layer out of it, it comes off pretty easily. Diced the fruit and tasted it. Honestly, it didn’t taste that good to me, it was rather blant. I felt I wouldn’t be able to eat the fruit just like that. 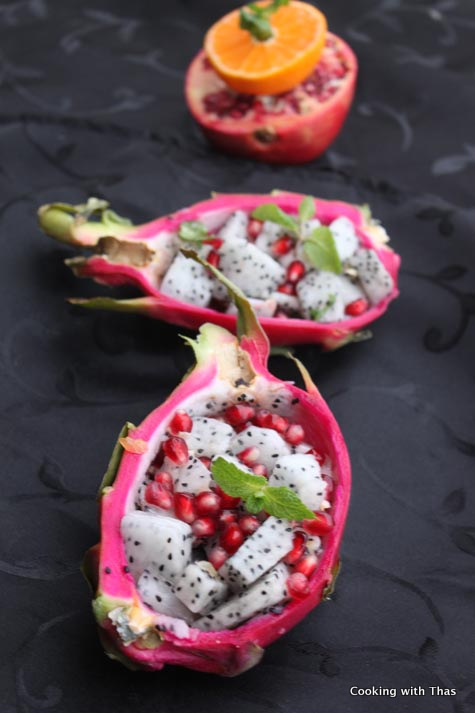 I felt that the taste of the fruit can be enhanced, that’s when this idea of making dragon fruit salad hit me. I had clementines and pomegranates in my refrigerator. I added pomegranates and clementines juice to the fruit along with mint leaves. The blant fruit started tasting good and it was refreshing! 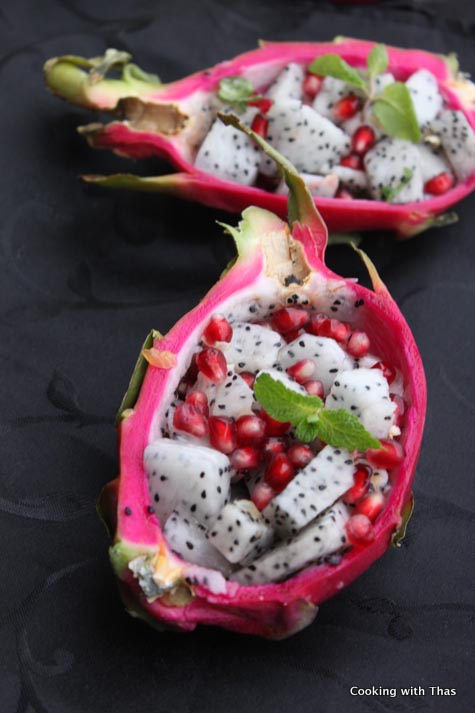 Choose a medium ripe dragon fruit; press the skin with your finger to see if it's ripe. Don't get the too soft or mushy ones. Cut the fruit vertically into halves, run a knife along the sides of the skin and gently scoop the fruit out of the skin, it would come out without breaking apart. Save the skin. 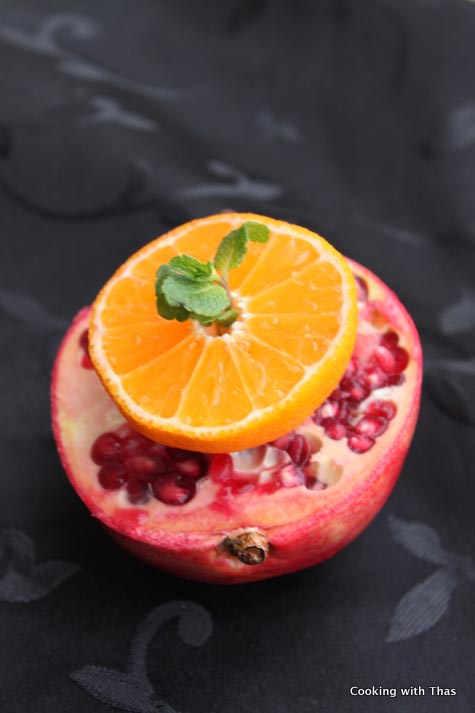 In a bowl, combine diced dragin fruit, pomegranate, clementine juice and mint leaves. Serve on the skin and garnish with mint leaves. Have it immediately, or you could even chill for sometime and serve.